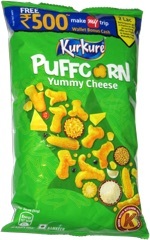 Taste test: These chips were very crisp, and they were extremely tasty, with a flavor combination unlike any we've tried previously. The bag explains that these chips include salt & vinegar, jalapeño, barbecue and sour cream & onion, and you really can taste all of those things (even if the bag's story of how they came up with the mix of flavors is quite suspect). The taste was sort of a sweet barbecue with smooth onion, a mild heat, and a strong vinegar zing. 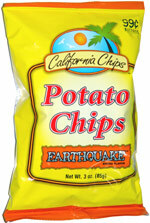 Despite the Earthquake name, there were many large, unbroken chips in the bag. Smell test: Nice potatoey, slightly barbecuey, kind of vinegary smell.